Brandon Thatch will move to the UFC 189 main card to face Gunnar Nelson. 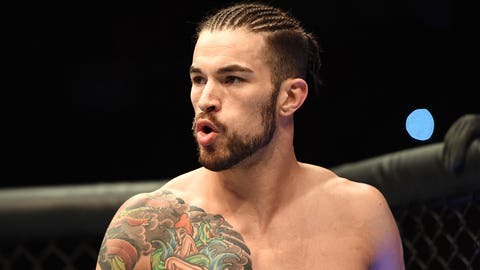 Following an injury to John Hathaway this week, UFC 189 has shuffled matchups with Brandon Thatch now facing Gunnar Nelson and Cathal Pendred stepping in to face John Howard on the prelims. Sources close to the situation confirmed the news to FOX Sports on Tuesday. UFC officials have not announced the new matchups yet. News of Pendred’s new fight was first reported by SevereMMA.com. Thatch was originally slated to face Howard on the prelims, but with the injury to Hathaway it left Nelson without an opponent. Thatch will now step into the fight with Nelson as part of the UFC 189 main card on July 11 in Las Vegas. Nelson’s teammate Cathal Pendred, who just defeated Augusto Montano at UFC 188 two weeks ago, will now step in to face Howard instead. Pendred has been asking for a fight ever since his last bout in Mexico City, and now he’ll get the chance to step up and fight at UFC 189 in Las Vegas. UFC 189 takes place on July 11 at the MGM Grand Garden Arena with Jose Aldo facing Conor McGregor in the main event along with Robbie Lawler defending the welterweight title against Rory MacDonald in the co-main event.